Titans hardback collectors library format is a winner with me as I've said previously in my review of Slaine: The King, and that opinion is confirmed with this edition of Dredd's epic crossing of The Cursed Earth. The package looks good, feels good and adds something to black and white artwork that makes these editions stand out from the crowd, but enough of treading over old ground. "There's a plague in Mega-City Two, and only Judge Dredd can deliver the cure! But first, he's got to cross the Cursed Earth - the radiation-ravaged wasteland that lies between the cities.. and although the land is barren, it's far from abandoned!" If you've ever read the Cursed Earth episodes then the colour splash pages that Mike McMahon and Brian Bolland produced for this epic must go down as some of the best double page images ever produced for 2000AD or any comic. Sadly these colour spreads are presented in black and white but the images don't lose any of their impact for not being in colour as they still pack a punch. Pat Mills' historic story line is still one of the best epics that has ever appeared with only two episodes in this edition being written by another writer (Loser's Leap & The God Judge episodes being written by John Wagner). 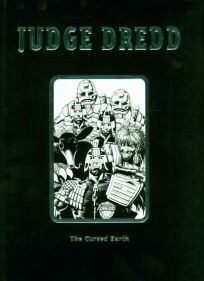 The majority of this Dredd epic was produced by Mike McMahon, and his artwork perfectly depicts the craziness and desolation of the Cursed Earth, with Brian Bolland's wonderful clean artwork being used to perfection, especially on the 'Mutie Mountains' and 'Tweak' episodes. This edition has a foreword which touches on the creation and history of the strip, some of the greatest cover images that have or will ever appear on the front cover of 2000AD and pin-up artwork by Brian Bolland. This edition is 160 pages, containing some of the best work Pat Mills, Mike McMahon and Brian Bolland ever produced for the future lawman. It would take another epic written by Dredd's creator to make Dredd truly his own again, but that's another story and review.